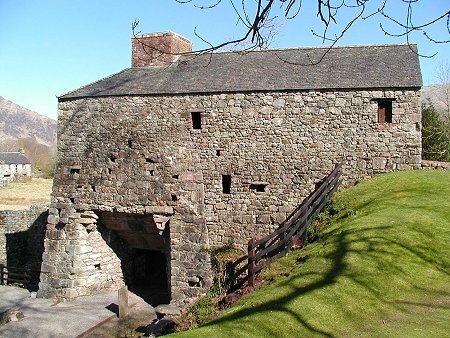 Just north of Taynuilt is the Bonawe Iron Furnace, a relic from an industrial past that produced anything up to 700 tons of iron per year from 1753 to 1876. It is in the care of Historic Environment Scotland. Your first reaction on finding a large iron furnace in this beautiful spot is to look at a map to work out where the iron ore came from. 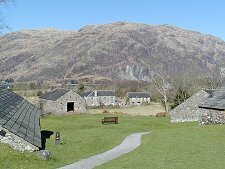 Your second is probably to look at the quarrying visible on the hillside at Bonawe on the far side of Loch Etive and add two and two. The discovery that the ore turned into iron at Bonawe actually came by sea from Furness, in what is now Cumbria, is a surprising one. Why would they bother? The answer revolves around the problem of transporting the fuel. 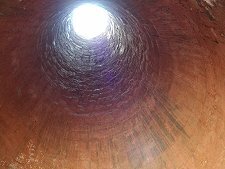 Until the widespread use of coke in the late 1700s, iron furnaces depended for fuel on charcoal. And the large scale production of charcoal needed an awful lot of trees. Still worse, transporting the charcoal was a hugely wasteful business. The approach adopted by the English iron masters who ran the business was to take the iron to the source of the fuel. As early as 1610 they had set up a furnace near Gairloch in the far North West. Argyll contained plentiful woodland and Loch Etive became one of a number of centres to which ore was transported for smelting. Their first efforts in this immediate area were further up Loch Etive at Glen Kinglass. This only operated from 1722 to 1738. 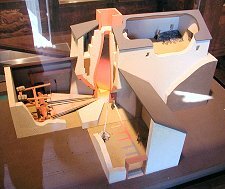 The lessons learned were used when setting up the Bonawe furnace in 1753. At its height, the Bonawe furnace was the centre of a significant settlement. The manager would have been supported by perhaps eight men producing the iron, plus up to a dozen more involved in arranging the delivery of the charcoal and maintenance of the site. They and their families, many from England, occupied the workers' houses still visible around the site. In addition there were up to 600 tree cutters and charcoal burners employed for at least part of the year across a huge area of north Argyll, coppicing wood and converting it into the fuel for the furnace. On average, a single day's production of iron required the the amount of charcoal that could be produced by cutting two acres of woodland. 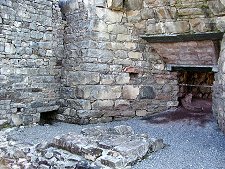 The centre of the process at Bonawe was the furnace itself. This was fed from the top with local charcoal, with iron ore from Furness, and with limestone from Lismore. Bellows driven by a waterwheel blasted air through the furnace, and the iron trickled out at the bottom. 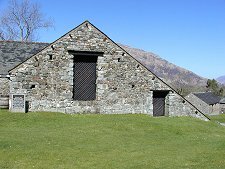 The iron produced at Bonawe was either cast into rough "pigs" for transport back to England and further processing, or it was cast into cannonballs. In 1781, Bonawe produced 42,000 cannonballs, varying in size from 3lb to 32lb. 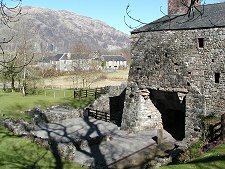 An iron furnace was originally set up at Bonawe because of the slight cost advantage it offered over production in Lancashire. Production petered out in the middle of the 1800s, and eventually stopped altogether in 1876. Advances in technology, and especially widespread use of coke, meant that iron could be more cheaply produced in northern England, and in the central belt of Scotland. Bonawe's 120 year industrial revolution was over. Bonawe today is set on a beautifully grassy slope facing north towards Loch Etive. The higher parts of the slope are occupied by the large charcoal stores, plus the ore shed, still stained red from the ore. 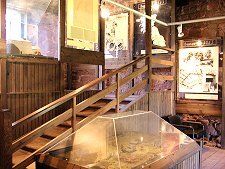 The ore shed also houses a fascinating series of displays charting the history of the site and information about the iron making process. Also on the site is a bark house. The oak bark, produced as a side product of the charcoal making, was valuable for the tanning industry. But the heart of the site today, as during its productive life, is the furnace itself. 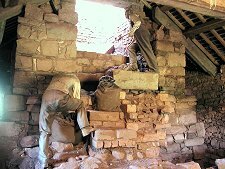 The upper parts of this show what worker's lives would have been like feeding the furnace, while the furnace itself can be seen from below via the hearth. Outside it is still possible to see the mill race from the reservoir to the south, together with the pit in which the water wheel sat until 1941.